Bangladesh Police Sub Inspector (SI) Job Circular 2019. Bangladesh Police Sub Inspector (SI) Job Circular 2019 has been published. Bangladesh Police Offical website www.police.gov.bd has been published this job circular. The authority of Bangladesh Police announced a job circular for SI (Sub Inspector). Check Latest notice of SI Job Viva, SI Written Result 2019. Many Candidates is waiting for Si job circular 2019. Bangladesh government every year has taken Sub-inspector by requirement notice. Now, the SI requirement circular notice 2019 has been announced. Generally, the police is a challenging profession and SI (Sub-inspector) job is very challenging & superior. The police of sub-inspector have always a lot of power to the people in the society. 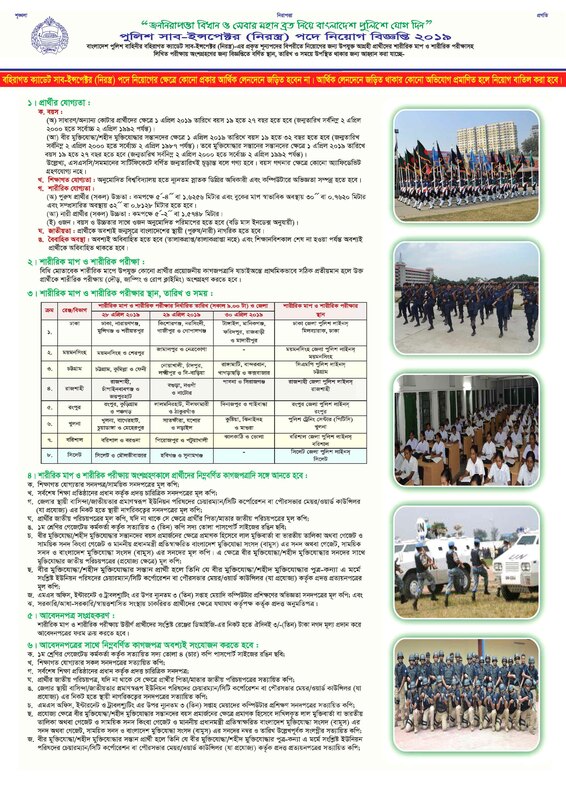 Bangladesh Police (BP) is always looking for enhancing its capacity and reputation by recruiting motivated, disciplined and educated police personnel. Therefore; Bangladesh Police (BP) warmly welcomes enthusiastic, tenacious and tough people to join the police and start serving and protecting the community, with the responsibility of maintaining law and order resting on them. Recruitment in Bangladesh Police is conducted in the four tiers/ranks such as Assistant Superintendent of Police (ASP), Sub Inspector, Sergeant, and Constable. A Bangladeshi male or female citizen fulfilling all required eligibilities can apply for any of these three positions and gets entry through rigorous physical and written test, interview as well as police verification. ■ Job Description: Sub Inspector Job is a challenging profession. Those who achieve this challenge they are applying for this post SI Job. General and other quotas (Male) Age: Must be 19-27 year in 01 April 2019, Height: 5’4’’ (Five feet four inch). Freedom fighter (Male) Age: Must be 19-32 year in 01 April 2019, Height: 5’4’’ (Five feet four inch). General and other quotas (Female) Age: Must be 19-27 year in 01 April 2019, Height: 5’2’’ (Five feet two inch ). Freedom fighter (Female) Age: 19-32 year in 01 April 2019, Height: 5’2’’ (Five feet two inch ). Bangladesh Police Sub Inspector SI written Exam Result 2019 will be published by this page. When will be published Sub Inspector Exam Result 2019 Can be download here? Bangladesh Police Viva Exam Result will be published Soon when will be published Same time we will be published this exam result here. So you can download this exam result by this page. Bangladesh Police SI Job Circular 2019 has been published. When Bangladesh Police Sub Inspector Written exam Result 2019 will publish then you can be download here. Bangladesh Police website will be published then you can download result our website Bangladesh police SI jobs Circular 2020 will be published. 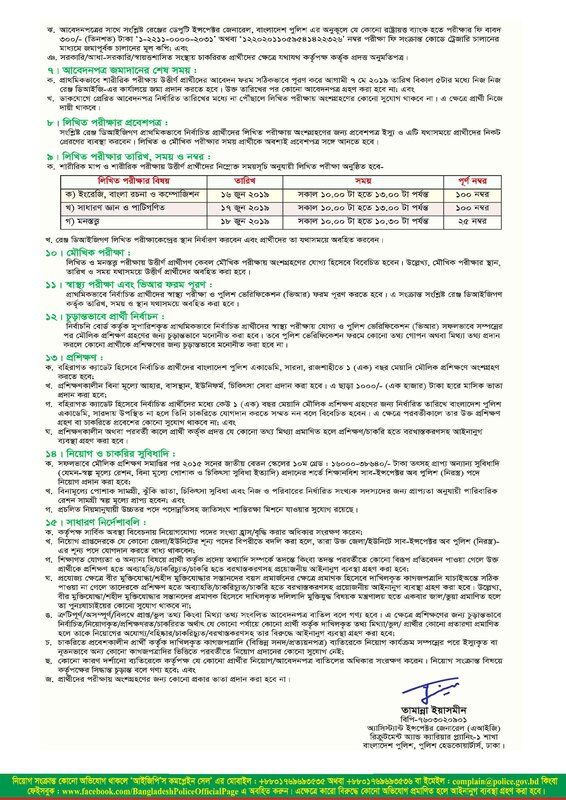 Bangladesh police announced sub inspector job circular 2019 will be published eight Division at a time. Recruitment is followed by a year-long training course at Bangladesh Police Academy as Outside Cadets. After this, the recruits are put through another year-long practical training with different police units. Sub Inspectors also undergo different in-service training courses at both home and abroad. At CID they undergo courses like Prevention of repression on Women and Children, Special Training Course on Human Rights, Prosecution and Investigation Courses, Post-blast Investigation Course, Training Course on Technology-based Investigation, Special Investigation Training Course, etc. At Special Branch (SB), they have courses like Basic Immigration Course, Pre-immigration Course, Basic Intelligence Course, Short term Intelligence Course, Basic Surveillance Course, Staff Development Course, and Third Eye Course, etc.